Pet owners know that the majority of emergencies happen late at night, over the weekend, and on holidays. In other words, when your primary vet is most likely closed, thus requiring a trip to the emergency room. 15 million pets went to the ER last year. The number of emergency cases spikes during the holidays, due to pets ingesting people food and other holiday objects. However, what you might not realize is how important your pet’s medical records are during a health emergency and how difficult they are to obtain over the holidays – when most primary vet offices are closed for extended periods of time. That’s why VitusVet launched a free app for pet parents, which lets users view their pets’ complete medical records at any time. It’s currently the only method that allows veterinary offices to share their patients’ complete medical records, not just lab work or vaccines, with their clients. I downloaded the free app and was extremely impressed by how easy it was to set up Mudpie's account. VitusVet then emailed my vet's office with a request to upload a PDF file of her medical records. Within a couple of hours I had all of her information at my fingertips. VitusVet also allows pet owners to upload their own notes, take photos, and schedule appointments with their veterinarians, in addition to the comprehensive medical history and the “Find an ER” function. Pet owners are also able set medication and vaccination reminders and invite family, kennel, dog walkers, pet sitters, and others to view their pets’ profiles, so everyone receives the same instructions for care. 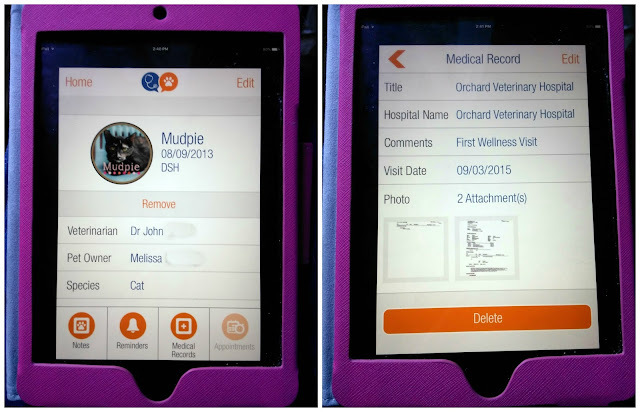 Additionally, the app allows for record sharing between multiple veterinarians – this is crucial, as many pet owners mistakenly assume an emergency clinic recommended by their primary care veterinarian will already have their pet’s record on file. Angel Tara had a primary vet, a cardiologist, and an oncologist, yet it seemed like every few months something brought her to the ER. The VitusVet app would have been invaluable back then. Now with Mudpie, I have the peace of mind that I'm prepared in an emergency situation. To download the VitusVet app, click here for iOS or here for Android. I was not compensated in any way to write this blog post. I'm sharing my experience with the app because I think it's such a great tool for pet parents. Having all of your records in one place is a great idea. We'll have to check this app out. We need to chekck this app out. It sounds like it would be really helpful. Sounds like a great app. My vet has a Pet Portal that allows us to do those things. Of course, if Cod forbid I had to go to ER, that might be a different story. Actually we haven’t played with the Pet Portal enough to find out.